Leather has properties that make it superior to other upholstery material. It has an exceptional long life, will not tear, and stretches and retains its shape without sagging. The leather we use to upholster our furniture is full grain leather, the finest quality leather. 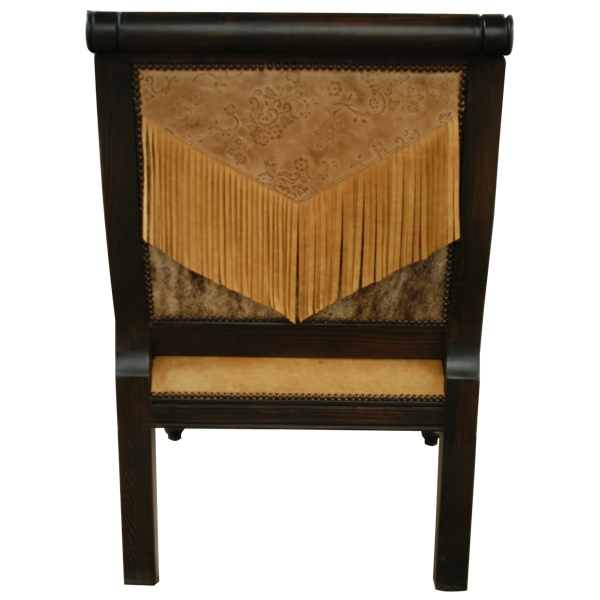 The seat, part of the armrest, the inside seat back, and the upper reverse seat back of this Western style handcrafted chair are upholstered in soft, brown full grain leather. 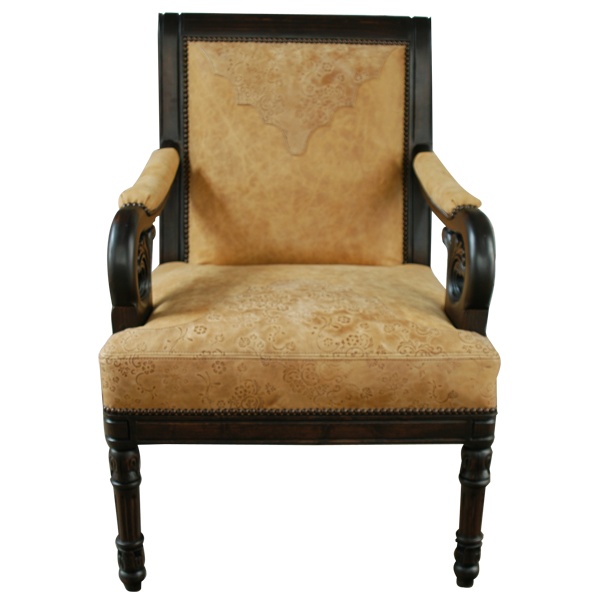 The lower reverse seat back is upholstered in patterned, real cowhide. The inside seat back has a Western cut design, and the reverse seat back is decorated with leather fringe in a “V” design. 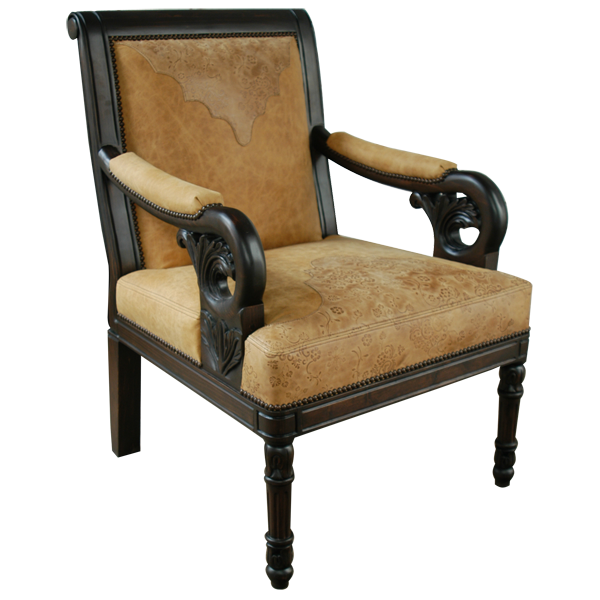 The upholstery is carefully hand tacked to the entire wood frame by our skilled craftsmen. 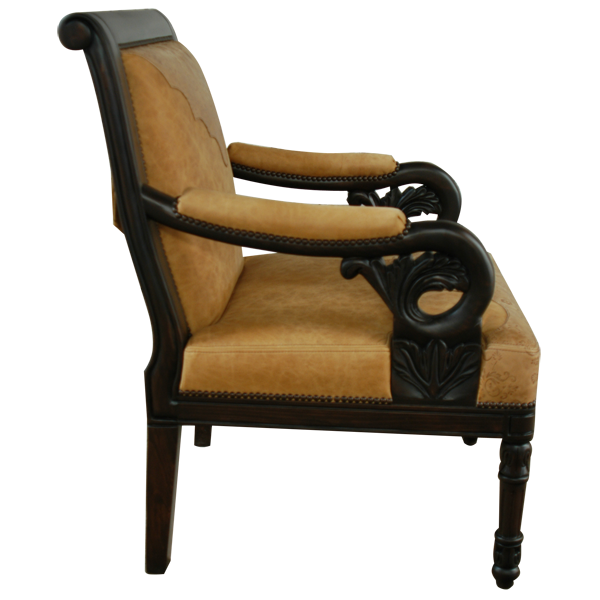 The armrest are beautifully curved and are decorated with hand carved reed designs and floral details. The top of the chair has a scrolled lip with reed accents. The slightly slanted front legs are beautifully hand turned and are decorated with hand carved acanthus and reed designs. The back legs are straight and tapered. Both beautiful and durable, the chair is made with the best wood available. The chair is 100% customizable.